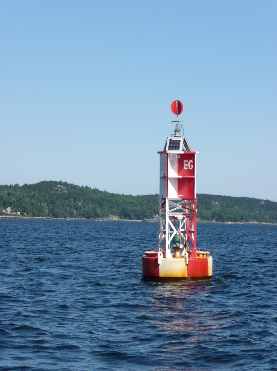 The Safe Water Mark, also commonly referred to as a “Mid-Channel Buoy,” “Fairway Buoy,” or “Sea Buoy.” is used to indicate safe water in all directions. It is most often used to indicate the beginning of a marked channel when approaching from seaward (offshore approach points). However, they may also be used at either end or along the centerline of any channel to indicate the best water. They can be passed on either side, although by convention they should be kept on your port hand. That way you will always be favoring the right hand side of the waterway. When the Safe Water Mark is the seaward most buoy, (“Sea Buoy”), they are used by the navigator as the Point of Departure or the Point of Arrival when beginning or ending an offshore passage; thus marking the point between open water navigation and pilotage. The Safe Water mark can be found in (4) basic configurations: A Combination Buoy, a Spherical Buoy, a Spar Buoy, or a Pillar Buoy. Markings - Safe Water marks are never numbered. However in the Americas, they are often marked with the initials of the waterway or port to which it is associated. Some places in the world they are often left un-marked. Colors - Color markings on the Safe Water Mark consist of Red and White Vertical Stripes, making it fairly easy to identify during daylight hours. Topmarks - With the exception of the Spherical Buoy, all other Safe Water Mark buoy configurations will carry a Topmark which will consist of a single sphere or ball. The ball or sphere topmark will always be Red. Light Characteristics – If lighted, at night or during the hours of darkness, the light’s phase can be either: Morse code “A” (one short then one long flash), Isophase, Occulting, or Long Flash every 10 seconds. It will only show a White Light. Morse code “A” is commonly found in the U.S. and the other light phases are common most everywhere else. 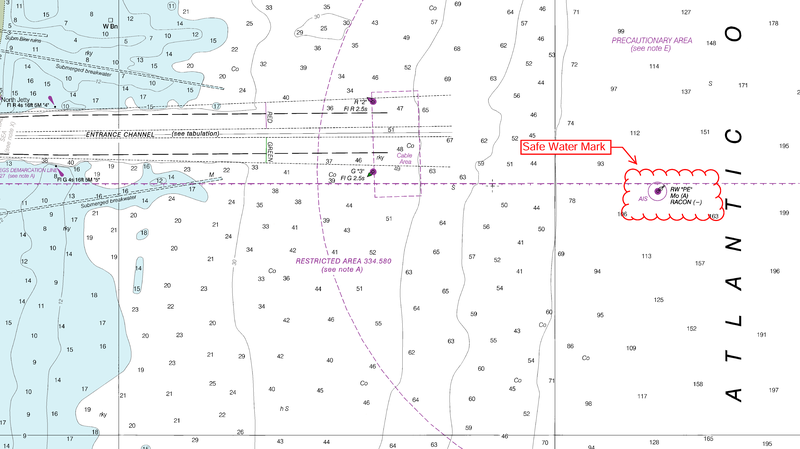 The above is the nautical chart notation for a "Safe Water Mark" showing a Red & White vertically striped buoy with a topmark of a ball or sphere (Red), it is marked "PE," it shows a white light displaying the Morse code letter "A " (· —), it has a radar beacon that will display a bright single dash on your radar screen - the equivalent of the Morse code letter "T," (—) and it is equipped with an AIS transponder.